This is a followup to a January 4, 2013 "Rich School, Poor School" post on fundraising and spending of PTAs at 14 popular elementary schools. The last section of that post contains information on how to find financial information about school PTA/PTOs. How much money can PTAs raise? As the charts below show, the amount PTAs raise is not just a matter of parent involvement. It's also determined by the number of families who have money to give. 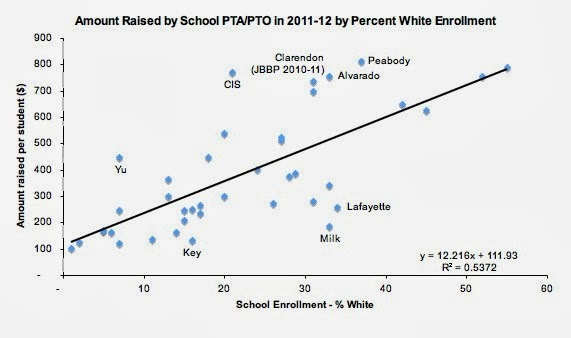 The association between the percentage of white students and amount raised is not surprising. As the table below shows, white families in San Francisco are much more affluent than other racial and ethnic groups. The list below is ordered by the amount raised per student. The information is based on tax documents submitted to the IRS. Only schools that filed a Form 990 with the IRS are listed. You can click on the tax ID for a link to the Form 990s. * Excludes fees for before/afterschool programs. ** 2010-11 tax info, student enrollment and %free/reduced lunch used. *** 2009-10 tax info, student enrollment and % free lunch info used. Nonprofit organizations that raise under $50,000 a year may file a Form 990-N, or e-postcard 990, stating this. No additional financial information is given. The following schools filed Form 990-Ns. SCHOOLS WITH NO PARENT-TEACHER ORGANIZATION OR NO TAX INFORMATION FOUND FOR THEIR PTO. **No PTA/PTO or fundraising webpage. IRS Form 990s: guidestar.org Create a free account to view the Form 990s. Post updated 8/2014 to reflect 2011-12 data for all PTAs/PTOs that submitted Form 990s. At the time of the original post, some schools had not yet submitted their 2011-12 Form 990s, and 2010-11 data was used instead. SF Geek Mom: Thanks for your efforts to keep us informed. I have an update/clarification regarding Glen Park Elementary. Our tax exempt status was revoked due to an IRS system glitch and will be current on 9/22/13 retroactive to 2011. In the meantime, we have been raising money under the school's tax ID number. Our fundraising efforts grossed 82,000 in the 2012/2013 school year. We have a very active PTO that puts on several community-building and fundraising events each year. Thanks for making the necessary adjustments in your article! I will let our PTO president know and I'm sure she can send you the documentation you need. Please send her your email via our contact page on the website. We as teachers work very hard to educate children and a group is trying to villainize us and make it so we can be fired more easily, which has led to a rash of teacher suicides as teachers are ranked by dishonest and humiliating test scores which don't take into account that kids are suffering in dangerous poverty. They are trying to sue and villainize us and make it so it isn't as easy to fire teachers. Good old Don is pushing this, www.sfedblog.blogspot.com. Please fight against this. Please go to protest at the cafe at 26th and Geary, tell the cafe you will never go there if they allow this hateful meeting. Please do not allow this abuse of hard working teachers. They are meeting 5-8 on Monday. I will have a picket sign and protest. We must unify against those who wish to villainize teachers, blame teachers for their own psychological or personal problems. The email is kfilesblog@gmail.com, A link to the form 990 is preferable, so the post can link to it like the other schools. Other schools' Form 990s can be viewed by clicking on the tax ID number below the name. per family (assuming 1 child) in annual fund donation? Yeah, huge ones, I went back to public school, felt really ostracized. I could barely afford the tuition and had better luck in the lottery the second time around. It was really embarassing. I was eating ramen and they were treating me like a reprobate for not donating. Which independent school were you at? I am currently at SFDS and they do not suggest a specific amount to donate to the annual fund at all (not sure which school suggested $3 K). My friend's child is in the upper school and she said she donated $1000 per year most year, but some give more or less, but no one talks about it. We sent a child to Convent for HS and could barely afford tuition (non-contributing parent with lots of income and assets in divorce situation put financial aid out of reach). We never donated and never felt the least bit guilty about it .Sorry but nobody can make you feel bad without your permission. Peabody Parent: Wow, thanks for the data and analysis! Confirms my sinking feeling over the last 2 years that we were trying to do too much and that the fundraising had gotten too big. PTA's can do a lot of good (and the GP PTA did do a lot of good for their own students) but when does it become too much? How do you determine what is too much? When does the line between public and private education blur? If your PTA is funding a significant portion of your school budget, should you really be getting a tax deduction for the donation? The title in the article was "How much can a PTA raise?" The question I am interested in seeing a discussion around is "How much should a PTA raise?" As I understand it, some other California communities have addressed this by putting limits on individual school PTA fundraising and amounts above that go into a general fund for the whole district. I wonder if this is a more equitable approach for what is considered a "charitable donation." The SFDS annual report conveniently lists all donors by name and stratifies donors who give over $3k. In 2011-12, 96% of families made a donation, but only 30% gave $3k or more. Under 10% gave over $10k. The remaining 70% of families contributed a relatively small percentage of money raised, under 25% of the annual fund, probably far less than that. My guess is that at very affluent private schools, most money is raised from a small number of big donors, like the one family that's given over $50k/year to SFDS . For everyone else, participation matters more than amount given. Hope this helps alleviate concerns about annual fund donations. Getting back to SFUSD PTAs, most don't have donors who can give so much. So some will specify a contribution amount in their fundraising letter. Claire Lilienthal requested $500 in their 2013-14 annual fund letter. Elliot here again. To clarify, our school (sfds) does not "conveniently list" or stratify the vast majority of annual fund donations (between $1 and $3K per family). It simply lists the more exceptional gifts on the annual report (sometimes called leadership" gifts) on the report to recognize them. This makes us feel comfortable, as we are a family in the majority that gives less than $3 K. Therefore, we don't feel we stand out or feel any pressure to give beyond what we can afford. Also worth noting that on our solicitation letter (which we just received), there is no suggested or average amount listed or given. I hope that does alleviate some concerns as geekmom mentioned above. I am however curious which school would ask for 3 K. That seems like a high bar to set for one family on top of tuition. Private school tuition does not cover the full cost of educating the students. We have kids in two different schools, and the delta between the actual cost and tuition is ~$3K for each of them, which is why I think that number gets thrown around. That said, we've never been asked to give $3K, and we've never come close to giving $3K each. We've also never felt the pressure to do so. Our experience has been that participation (at any amount) is as important, if not more important, than the actual amount. Money from fundraising can indeed buy certain conveniences; but more money does not necessarily equate to academic success, however you want to define the success. Another Peabody Parent: So are you suggesting that if we raise beyond our "x" target amount, we should then allocate that excess amount to a general fund for the whole district? I contribute $ so that my contribution benefits GP. I'm guessing you are a parent of a K-2. I think this year GP will see a decline in "giving." The benefits of having a robust PTA are also sometimes its downfall (I.e. too many "participants" eager to spend $ for their own, individual "pet-projects"). Correction: I should not have said "too many participants eager"..... I should have said "a few eager." I get what OGPP is saying. The disparities in public schools are really pretty shocking and it's been one of the biggest eye-openers in my process towards kindergarten. I toured about a dozen schools all over the spectrum in terms of PTA funding/parent engagement. And now we've attended two different elementary schools, switching to a school with a higher level of PTA funding after the first 2 weeks. There was a very clear and pervasive difference in the schools that lacked a well-funded PTA and it did sort of depress me. Public schools should strive to be equal, to the extent possible, in terms of amenities and access to enrichment programs and they're really not. It's really unfortunate that the state support for public school has declined to such a significant degree these days and parents are now making up the gap. 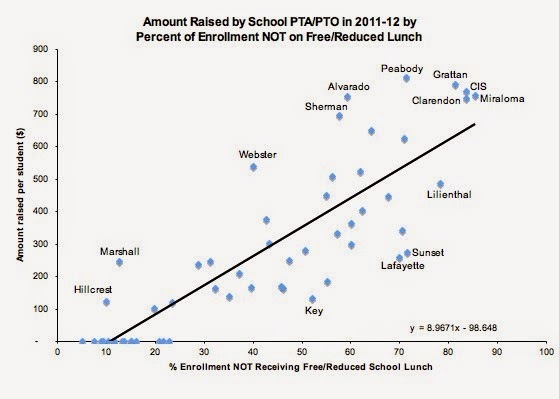 The schools without an active PTA or fund drive get left behind and the achievement gap widens. it would be great if there was a mechanism that redistributed some of the funds, though I know if would be a hard sell to parents (Me inlcuded!) who are really doing the best they can to keep their own school afloat. We are also at SFDS and our letter did specify a suggested donation amount. I wonder if they suggest specific amounts for families they think (based on what I don't know) can afford to donate more. For example, my letter referenced the gap but also said that a gift of any amount would be appreciated, despite the gap being that high. Having polled a few fellow parents in K, none are planning to give the gap amount (consensus out of my sample size of 4 is that we'll all give between $1-2 K). hope this is helpful additional color. No, our letter talked about the gap between tuition and actual cost per student, and then later in the letter asked us to consider giving $__ amount (different from the gap amount). Thanks for the info about what others plan to give. It is a little hard to tell how much is expected.